These cupcakes may look normal, but they are hiding a pretty exciting secret. I don't know if you have ever seen 'The Rocky Horror Picture Show', but I do know that if you haven't, you really need to - when I was younger, it was one of my favourite films (which may explain a thing or two, come to think of it). I loved the craziness of it all, the bizarre characters and the glittering costumes. And most of all, I loved (and still adore) the music. Richard O'Brien really is a lyrical genius! My favourite part (save the scene at the dinner table, where Brad, Janet et al realise that they've been eating Eddie for dinner) was always where Frank N. Furter brings Rocky to life in the lab. I used to LOVE the way the fluid in the tank containing Rocky turned all the colours of the rainbow as the crazy, high-heeled and fully made-up doctor added various chemicals, creating the 'secret of life itself'. Looking at it now, it's hardly the most exciting of special effects, but it's still quite something to watch. But what does all of this have to do with cupcakes? Well, not a lot. Not if you're talking about regular cupcakes. But that is not what these are. No sir, these are RAINBOW CUPCAKES! colours you can make out through the cupcake wrapper are just like the colours in Frank N. Furter's tank, no? I made these for Katy (she of azuki bean stew fame). She has a December birthday, which I always equate to being a bit rubbish. My step-brother has one too, and I have seen what happens time and again: birthday presents wrapped in Christmas paper (inexcusable! ), joint Christmas/Birthday presents (lame!) and even joint parties. Hardly the way to make the birthday boy/girl feel special. Anyway, I wanted to take some cakes to her party, and figured that rainbows were pretty far from what most people think of as Christmassy. Plus, like me, Katy's a child of the eighties, so there's always the Rainbow Brite connection for those who wish to make it. They were simple to do - just regular cake mixture, split six ways and dyed accordingly - and a fun way to spend an hour on a cold, dark afternoon. Incidentally, I know that it's now January. I just forgot about the fact that I'd made these until now. Probably something to do with holiday hustle and bustle (and my sieve-like memory). Apart from Lucy and Rich's wedding cakes, nothing I have baked has ever caused so many people to tell me I am amazing. I'm not pointing this out to big myself up - I'm just letting you know that you'll rock whatever party you're going to if you take along a dozen of these little twinklies. This is a fact. 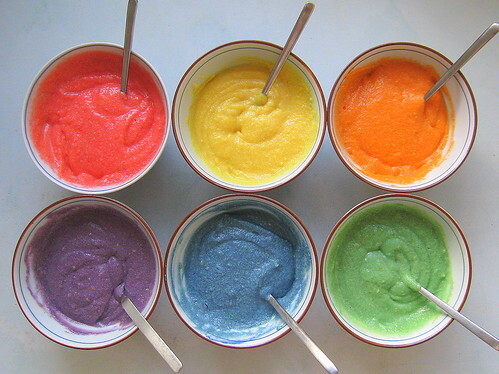 Let's just have a quick run-through of the RAINBOW CUPCAKE making process, shall we? And bake for 20 minutes, before cooling on a wire rack. The surfaces look like craters on some far away rainbow planet! To me at least. I made them lemon flavour. This is not just because lemon is officially the best flavour cake can ever be, but also because the icing is cream cheese and I think the tastes marry quite nicely. You can make them whatever flavour you like though. People are more likely to notice the colours than the flavour anyway. Unless you think of a flavour to match each colour and add it to the coloured mixtures accordingly. I did want to do that, but it seemed like too much work. 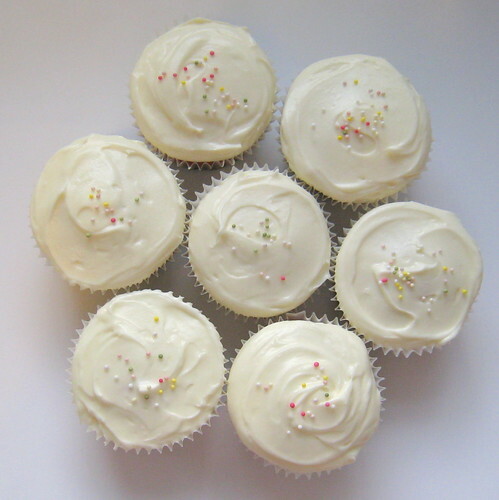 I concede though, that a six-flavour cupcake really would be a party in the mouth. Make the cake mixture following whatever method you normally use. I recommend, as always, the all-in-one; place the eggs, sugar, butter and flour (all at room temperature) in a large bowl, along with the baking powder and bicarb., and mix using an electric hand whisk until combined. Add the lemon juice and zest, and mix again. Divide this mixture equally into 6 bowls and tint each a different colour of the rainbow. Bake for about 20 minutes at 180°C, until a tooth pick inserted into the centre of one of the cakes comes out clean. Cool on a rack. DO NOT COOL IN THE TIN unless you want soggy cupcakes. Use the icing to frost the cakes - a palate knife makes pretty swirls. Finish with hundreds and thousands, and remember: less is more. 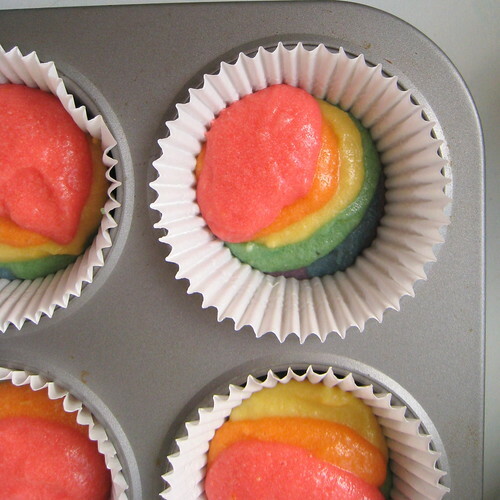 You want the cupcakes to look sweet and innocent, so that the rainbow is a surprise. Very creative! I like it. Very creative, colourful & beautiful! WANT! So cute and I love lemony cake! I love making rainbow cake- I had a phase when all I made was rainbow cake. I miss the phase... I think it's rainbow time again! OMG! I'm soooo tickled by these! I'm going to have a go at these for the next visit to the nephews house. They look great and I'm sure the kids will love them. Thank you so much Mr P for visiting my blog while I was away! Sorry for coming so late to visit your, but I only got back two days ago! I also glad you came cause it gave me the chance to discover your very nice blog... which I'll surely come visit again! A very happy new year to you and your family, and what a great way really to start it... than with amazing rainbow cupcakes! Niiiiice! Mr. P - these photos? Amazing. My favorite yet... plus the Lamington idea has had me working all week on my version! These are adorable! I love them!! Mae - that's so exciting that you're planning something cool. I can't WAIT to see it. I get excited every time I see the word lamington! Gorgeous! I have always wanted to make something like this. soooo pretty and adorable! :) i am in loveeee! ~Awww!! I make these! But i have a thign about things that are too brightly coloured! so when i make my batter i just chuck in some sugarstarands and get little flecks...!! oh i love cake...cake loves me. Hello Mr. P! Your blog is rather entertaining, and full of deliciousness, I am salivating onto my keyboard. :P I love the idea of such a colorful cupcake. I was thinking of doing something similar, but layering flavors--chocolate, peanutbutter and banana! FuriousFeng - I LOVE that idea. The natural rainbow. Of chocolate! If you do, you have to send me a picture! Love your blog by the way - beautiful design! 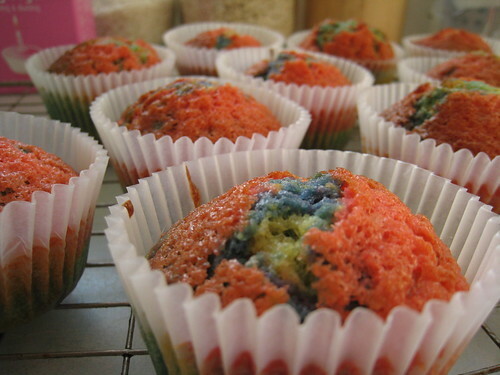 These are quite beautiful -- and the intricate process you had to go through to make these "rainbow" cup cakes is amazing. Beautiful job! These are amazing.1st time here on your space. Thanks Joy! It was time well spent though, as the decorating was EASY. Oh man, those look awesome. I taught myself to cook ages ago as a defensive measure, but baking scared me. This may be the recipe that makes me try. Are they as time consuming as they look? Very cute! I really like your photos, especially the ones of the unbaked batter. Fun! I've seen various versions of these in the last year of so popping up all over the fellow bloggers blogs, and am looking forward to having a go myself. 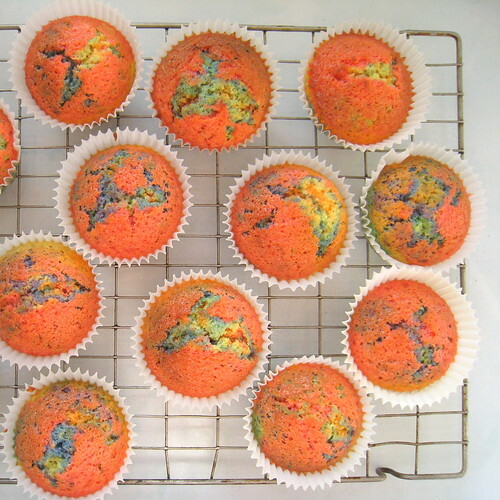 My kids will love these - but think I will call them tie-dyed cup cakes! Mike - Do it! Baking = Happiness. Miranda - If you aren't trying to take pretty photos at the same time, they're pretty quick to do. I was in the kitchen for about an hour and a half. But without photography, I reckon 40 minutes max. If you use the all-in-one method. Thanks Hungry Dog! :) They're my favourite too. MangoCheeks - do. And send me a link! saw these on photograzing and had to come see the full post! TOO CUTE! I made rainbow bunts once before, it is TOO much fun .. sooo many dishes though. very nice....will make if for my sons birthday ..
LOL... "Don't dream it/Buttercream it..."
The rainbow cupcake is very neat, love it! my daughters would LOVEEEEE this. Like the rainbow cakes Mr P. Will have to show the recipe to Mrs F.
Wow Peter.... I love these cup cakes....!!!!! I will try this recipe!!!! well done darling!!! you are very good!!! I just lost two hours reading the original Something Awful rainbow cake thread. All I can say is, I have to do this. Rose/orange/yellow etc tints my world? Nicoletta - DO! You should make Rainbow Tiramisu. You know, the Italian touch! SilverMoon Dragon - Another RHS reference. I ♥ it! 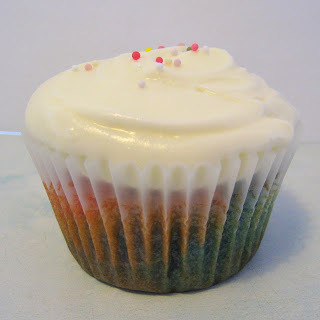 In one of those exciting, serendipitous cosmic moments, I made rainbow cupcakes on the same day that my friend shared your blog's link with me. I did not get a chance to peruse until later in the day, and you can imagine how excited I was to see your published (and beautiful) photos of what I had just done in my very own kitchen! I got the idea from a random site online (I believe as the result of a google search?) but will say your entry on them is far superior. I can't wait to explore the rest of your site and try more recipes. Love it. Hi! I've been staring at your blog all afternoon- its awsome! 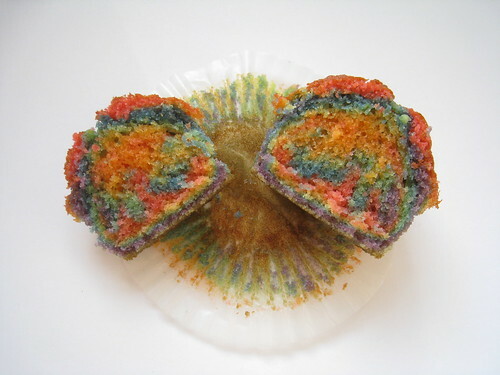 These cupcakes look great, I actually already made something just like that(lemon flavored, rainbow, and made in the same way; happy minds think alike, huh?) , they were really pretty, but didn't actually taste that good, yours look much yummier!